Chabad of Lincoln Park is dedicated to serving your Jewish needs in a personal and professional manner. We welcome people of all backgrounds and affiliations. We offer prayer services, classes, Shabbat dinners, and social events. 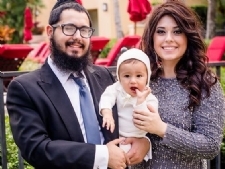 Chabad of Lincoln Park was established in the summer of 2012 and is directed by Rabbi Mendy & Mrs. Brocha Benhiyoun. Chabad of Lincoln Park is a branch of the Center for Jewish Life with locations in the Loop, Gold Cost, Lincoln Park & South Loop. The Center for Jewish Life has been serving the downtown Chicago area for 25 years and is directed by Rabbi Meir Chai & Mrs. Rivkah Benhiyoun. Mendy was born and raised in Lincoln Park. He spent three years at a Yeshiva (Talmudic academy) in the suburbs of Paris, France. He then he moved on to a Yeshiva in Frankfurt, Germany where he was able to not only study extensive Jewish texts but he also got to live with the Jewish community there and get an up close look at life amongst this fascinating and close knit Jewish community. His rabbinical journey took him back to the States where he completed his Yeshiva education in New Haven and Brooklyn. Brocha was born in Palm Beach, Florida. After spending a year in New York studying she returned home to help establish a vibrant Preschool. Her expertise with students is her caring and patient attitude towards each child individually and the belief in finding the good in every one of her students. What she enjoys especially is creating a community environment within the school. Brocha looks forward to a new step in her journey of serving as Co-Director of Chabad of Lincoln Park and its' Hebrew school.